In our recent interview with writer-director Hossein Amini – of which you can read here – he talks about how he read Patricia Highsmith’s novel The Two Faces of January at university and decided that it would be the first film he would both write and direct. Sure enough, after years of the adaptation going through various studios and directors – among them the late Anthony Minghella, whose previous Highsmith adaptation of The Talented Mr. Ripley would have made him an ideal candidate – Amini has finally gotten his wish, and judging by the sheer passion of the debut director it is clear that it has been worth the wait. Amini has chosen to keep the story focused on its trio of characters, all played brilliantly by Viggo Mortensen, Kirsten Dunst and Oscar Isaac. This is an intelligent choice, because the weight of the story rests entirely on the relationships between all three characters. When you see Mortensen’s Chester and Dunst’s Colette together for the first time, they have legitimate chemistry and appear to be a believable couple. Isaac’s Rydal is attracted to Chester because he reminds him of his father who recently passed away and to Colette because of her own beauty and charming personality. As the film goes on, these relationships are warped to the nth degree with none of them emerging unscarred by the end, highlighting the tragedies and inner complications of each character. Chester’s paranoia increases as he begins drinking heavily and acting aggressively toward the others; Colette’s dependency on Rydal increases as she continues to find herself trapped in a marriage that might not be as glamorous as first thought; and Rydal becomes trapped between his loyalty for the charming couple and his own moral compass. These are three very well-crafted characters brought to life in Amini’s smart screenplay and focused direction, and it’s down to the individual performances that help them literally leap off the pages and onto the screen as real people caught in undesirable situations. It is also fascinating how, on the outside, the story seems very simple and easy to follow but there is still a lot happening underneath the surface that we are not even aware of. From character development to the choice of location – much of which is beautifully shot by DP Marcel Zyskind – there is a great deal to admire whether it’s subtle or directly in front of you. One of the highest compliments anyone can give to a first-time director is to comment on how balanced everything feels, with everything given an equal amount of attention to stand out and improve the film as a whole. Some first-timers may choose to favour one element over another which would in turn make the product seem uneven and misguided in how to portray their stories. Amini avoids this pitfall, ensuring that all necessary elements from its cinematography to Alberto Iglesias’ thrilling score to the production and costume designs are allocated a fair amount of screen time to dazzle the audience, never once letting the style overshadow the substance. It’s a perfect blend of both, and ends up being a more satisfying movie because of it. The third act is when things start to become a little by-the-numbers in terms of its thriller genre, but even then it’s not entirely distracting. If anything, it showcases Amini’s competence behind the camera even more. In lesser hands it probably would have strayed more into cliché and generic resolutions, but there is a genuine feel of tension that feels neither forced nor unnatural in addition to an underlying intelligence that makes the eventual outcome satisfying for all parties with no real plot threats left dangling loose. 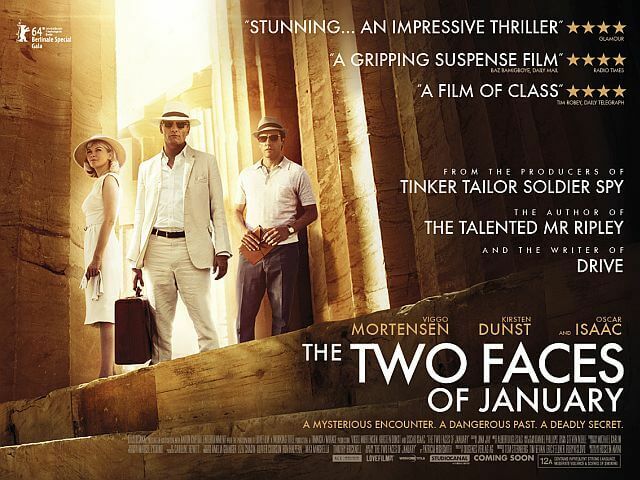 If The Two Faces of January is anything to go by, Hossein Amini shows great promise as a writer-director that shows great passion for the stories and characters he is projecting onto the screen, and we anticipate learning where he aspires to go from here. Take note, Wally Pfister; THIS is how you make a directorial debut. 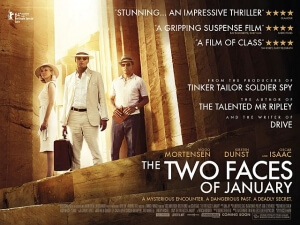 The Two Faces of January is an especially strong directorial debut by Hossein Amini, boosted by excellent performances by its trio of lead actors and an impressive use of mise en scène to tell Patricia Highsmith’s classic story on the big screen.